Our financing and insurance products protect your BUSINESS, not just get you a patent. Patent Financing – We Pay All Your Patent Costs. We give you advice that you could never get from your patent attorney. Our financing program is a non-dilutive investment in your company. Why get patents if you cannot enforce them? Think again. Affordable insurance means you can go after those companies who copy you. Insurance makes your IP assets valuable because you can enforce them. Defensive insurance makes sure a lawsuit doesn’t put you out of business. Borrowing Money using Patents as Collateral. You have valuable IP assets, so use them to fund your company. Your patents and trademarks can be used as collateral. BlueIron offers a unique insurance product that insures a bank so that they can loan up to $5M on your existing assets. 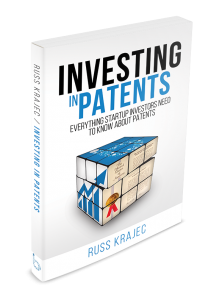 Russ Krajec’s new book on intellectual property from an INVESTOR’s perspective. How to do due diligence on a startup company. How startups use their patent assets. A patent roadmap for startups – the first patent is not the most important one. What Do BlueIron Customers Say? Hear from Thomas Ruge, CEO of Colorado CodeCraft about financing patents through BlueIron. What is important to Colorado CodeCraft? BlueIron’s incentive is to get the best patent possible. Portfolio is curated to your products, your marketplace, and your competitors.